Avro Arrow CF-105 and Canadian Aerospace. 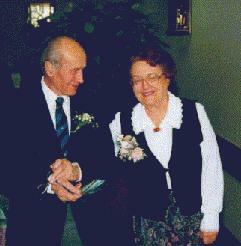 Original Image signed by Jan Zurakowski. The Avro Arrow Chat board. Visit the Avro Arrow message board. Like many Canadians, I have an interest in the history of Canadian aviation and aerospace. One of my particular interests are the events that surround the development and ultimate destruction of the CF-105 Avro Arrow. A review of the Internet will reveal that there are many fine pages already in existence that are dedicated to explaining the purpose of the AVRO Arrow. Not wishing to duplicate their efforts, I have decided to design this page to supply information that is generally not found on most of the other Arrow pages and to provide links to some of the more notable Arrow home pages. This page is also a member of the Avro Arrow web ring and you can connect to other web ring sites at the bottom of this page. As well, since the Canadian aerospace industry is now flourishing, I have also created a series of links to some of the aerospace leaders in Canada. 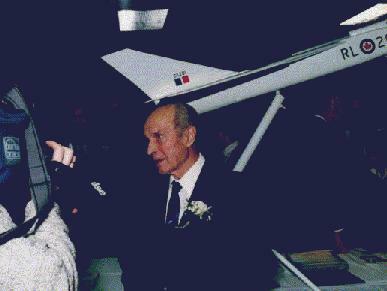 Jan Zurakowski in front of a model of Arrow 201 at the 40 th. anniversary of the first flight of Avro Arrow 201 on March 21, 1998. David Onley , was the Master of Ceremonies . Nicholas Doran had to take over at dinner as David had to leave. Grace and a toast to the Queen of Canada . Meal, with music from the RCA Cadets, Avro Arrow Squadron "845" . 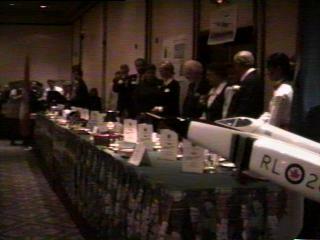 The head table was introduced and then a video was shown: "Supersonic Sentinel" . After the video, the past employees of Avro Canada and the past and current employees of Orenda were asked to stand up, and they were then toasted by the people in attendance. 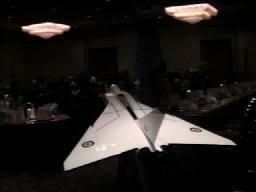 Jan describes his experience of being a test pilot of the Arrow with comparisons to the CF-18. 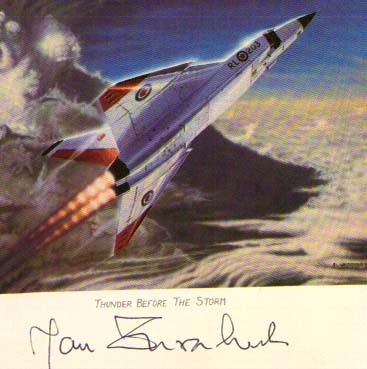 Jim gave a very interesting and revealing talk on such things as the destruction of the Arrow, who ordered the destruction, the CBC mini series movie: "The Arrow", the fate of the "lost Arrow" and what it was like to work for AVRO. Although the Arrows and their related material were ordered destroyed 40 years ago, some bits and pieces did survive and a few more items do seem to appear from time to time. This section of the Arrow home page is intended to list all of the remaining Avro Arrow CF105 "artifacts" in existence. Some of them are in museums, some are in libraries and archives, and other pieces....? 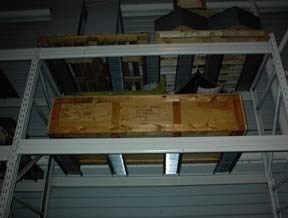 The following list shows where some of the material is located. National Aviation Museum in Ottawa. 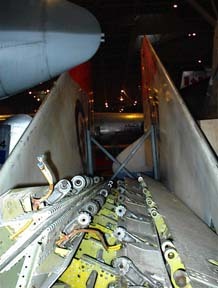 The museum has the nose and cockpit section of Avro Arrow RL 206, a main undercarriage leg, a nose undercarriage, a PS-13 Orenda Iroquois engine, wind tunnel models, Arrow simulator instruments, two outer wing sections and various smaller components such as cockpit cowlings, clamshell doors and compressors. National Research Council, Aeronautical Library. Various technical manuals and drawings on the Arrow are known to exist there. National Archives of Canada. Various documents relating to the Avro Arrow can be found there. DND. Some of the material on the Avro Arrow is still classified after all these years! Second Velvet GLOVE Missile. Information about "another Piece that got away". However, some say that the Velvet Glove was actually intended for the CF-100 and was deemed to be inadequate for supersonic use in the Arrow Project. Homage to the Avro Arrow This is one of the best sites on the Internet about the Arrow! Many high quality graphics, documents, stories and links. Check it out! The Avro Canada Archives Digital Archives.Photos, stories and history from A. V. Roe Canada.. A great site with lots of pictures and information about all the aircraft that were created by Avro Canada. VA3KGB - (Amateur Radio, Avro Arrow, UN, Scouts, Canadian Forces, Military Aviation) Another good Arrow page with some excellent pictures and links to other Arrow sites. 845 Avro Arrow SquadronA Royal Canadian Air Cadet Squadron named after the Avro Arrow. This site naturally contains a section on the Arrow. The Canadian Air & Space Museum. (formerly the Toronto Aerospace Museum) This organization has recently built a full scale all metal replica of the Avro Arrow. Check out the final completion of this Arrow Model and other projects at the museum. Photo of TAM Arrow by Peck Duff. August, 2000. 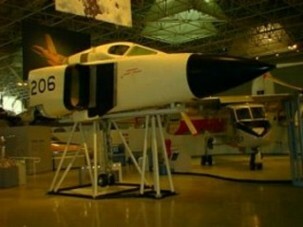 TAM CF-105 AVRO Arrow Full Scale Model. This section of my home page shows the many early stages of construction of the The Canadian Air & Space Museum's Full scale all metal model of the CF-105 AVRO Arrow. These are my own pictures and those provided to me from Peck Duff. I am also a member of this museum and I contributed to this project both financially as well as doing some research on the wing Roundel in Ottawa. 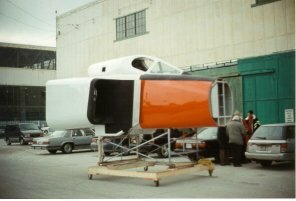 The main goal of the Arrow 2000 project is to build and fly a "piloted" scaled down version (2/3 scale) of the Avro Arrow. 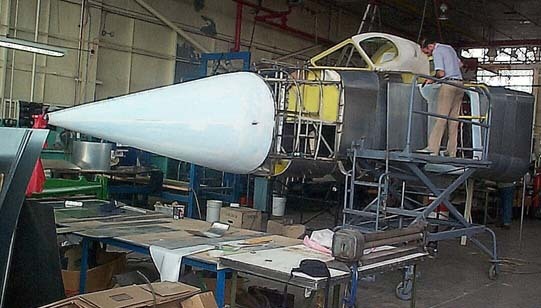 Other aviation related projects are also being developed. The Arrow Canada Recovery homepage. They are a non profit group of volunteers that located missing Avro Arrow flight test models in June 1999. At this time they are currently in a fund raising mode. Funds are required to complete the goal of recovering the models from Lake Ontario, restoring them if required and assignment to aviation museums. Please support their cause and visit their site! 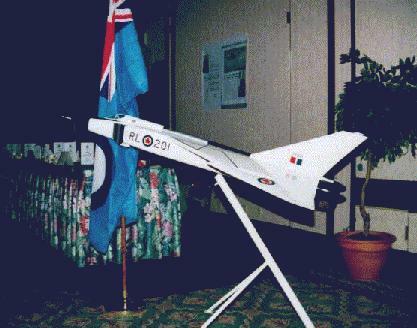 The home page of FHYBR MODELS, manufacturers of the Radio Controlled Jet Model kit of the Avro Arrow. Visit the Avro Arrow message board. . The Canadian Arrow is a 54-ft long, two-stage, three person sub-orbital rocket with the second stage doubling as an escape system. The first stage is 33.5 ft. long and 5.4 ft. in diameter with four fins at the base for aerodynamic stability. A single 57,000-lb thrust liquid propellant rocket engine propels the first stage. 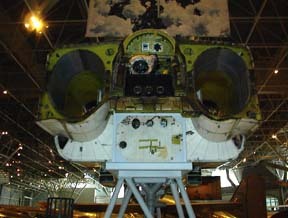 The first stage propellants are fed to the engine using a pressurized gas system. This system is made up of two propellant tanks for fuel and oxidizer, topped by a single composite construction high-pressure gas sphere. Steering of the vehicle is accomplished using graphite jet vanes and aerodynamic flaps on the fins. The second stage (crew cabin) is 20-ft. long and 5.4 ft. in diameter at the base, and contains four JATO type rocket engines for second stage propulsion. These solid rockets can be fired at anytime during the flight, including a launch pad abort. If you find the story of the Arrow a bit depressing, do not despair! The Canadian Aerospace industry is still around and has very much recovered from the dark days of the late 1950s. As Jim Floyd said at the 40th anniversary of the first flight of Avro Arrow 201, we should be proud of the people who are working in the Canadian Aerospace industry today, and we should tell them that we appreciate what they are doing for Canada. "Hear, hear!" Aerospace Heritage Foundation of Canada.This fine organization is dedicated to preserving the memory and accomplishments of Canada's aerospace heritage. One of their current projects is the location and recovery of the Arrow free flight test models from Lake Ontario. 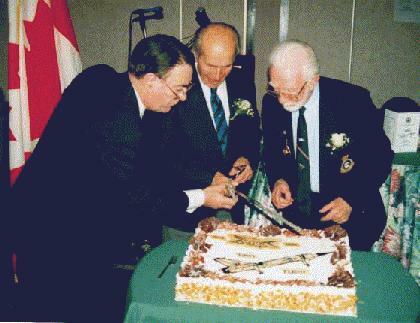 The AHFC organized the 40th anniversary celebration of the first flight of Arrow 201. The RCAF Home Page A site that is dedicated to the history of the Royal Canadian Air Force. Some Avro Arrow information is also located there. AIAC The Aerospace Industries Association of Canada (AIAC) is the national trade organization of Canada's aerospace manufacturing and service sector. Pratt & Whitney Canada Gas Turbine Engines. NAV Canada provides air traffic control, flight information, weather briefings, emergency assistance and other services for those who fly in Canadian air space. Airforce Magazine of the Air force Association of Canada Airforce is Canada's foremost aviation and aerospace magazine. Wings Magazine Canada's Aviation Magazine. Canadian Harvard Association Home page. Canada's DND "Airforce" Home Page. Helicopters Magazine. Canada's national helicopter magazine. Pilots resource to flying in Canada. Esprit de Corps, Canadian Military Magazine. Esprit de Corps covers the efforts of Canadian soldiers in both World Wars and the Korean War in every issue, as well as their current deployments on peacekeeping missions around the world. Canada Aviation Museum Home page from Ottawa. One of the best aviation museum collections in the world..
RCAF Memorial Museum. The official museum for the R.C.A.F. Canadian Warplane Heritage Museum Canada's Flying Aviation Museum from Hamilton Ontario. The Nanton Lancaster Society and Air Museum. Home of the Nanton Lancaster bomber. Nanton, Alberta . Camp X. Information about Camp X by Lynn-Philip Hodgson. This page includes directions to the monument, and what remains of Camp X. The Oshawa Military and Industrial Museum is Located in Oshawa, Ontario, We currently house the Largest Collection of running and Otherwise Operational Military equipment in Canada. Tours can be aranged and are always Welcome. Canadian International Air Show Toronto, Canada Home page. London, Ontario Airshow and Balloon Festival Home Page. International Council of Airshows Home page. 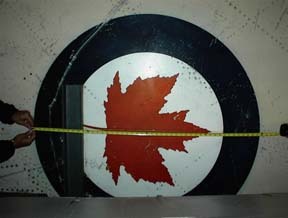 This Avro Arrow Web Ring site is owned by Michael Kostiuk. Want to join the Avro Arrow Web Ring? Last Update: April 15, 2010.